From cruising along sidewalks to zipping up and down the halls in the house, one instantly recognizable red and yellow automobile has been a part of childhoods for more than three decades. This year, MGA Entertainment Canada, makers of Little Tikes, is celebrating the 35th anniversary of its most iconic toy, the Cozy Coupe. The Little Tikes Cozy Coupe was ‘born’ in 1979 in Hudson, Ohio, weighing 19lbs, 12 oz and immediately began taking children on adventures. After getting its bearings in the USA, it took a ride to Canada in 1985, with the establishment of Little Tikes™ Canada. By 1991, the Cozy Coupe was selling 500,000 units per year, making it the top-selling model in the United States, outselling the 399,000 Accords and 299,000 Taurus vehicles sold that year*, and by 2003, 10 million Cozy Coupes had been sold worldwide**. In Canada, the Little Tikes Cozy Coupe sells an average of 422 cars per week. 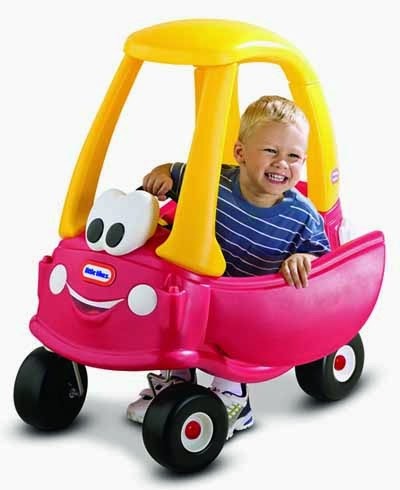 Since its debut, there have been a number of variations of the Cozy Coupe to hit store shelves in Canada, including the Princess Cozy Coupe, the Cozy Coupe truck, the Ride and Rescue Cozy Coupe and now the brand new Cozy Coupe Sport, a stylish and trendy edition of the classic automobile. • Cup holders in the back – not even the Porsche 911 has those! For more information on MGA Entertainment Canada or the Little Tikes Cozy Coupe, visit MGAE.com or LittleTikes.com.